It's used for every imaginable purpose from family-mover to New York City taxicab. It lures the environmentally conscious intent on a fuel-stingy daily commute. The impatient traveler drives solo without penalty in California's heavily patrolled carpool lane, thanks to its eco-friendly status. The “it” is the 2013 Prius hybrid auto. And it has attracted one of the most diverse collection of fans of any contemporary auto in the U.S. 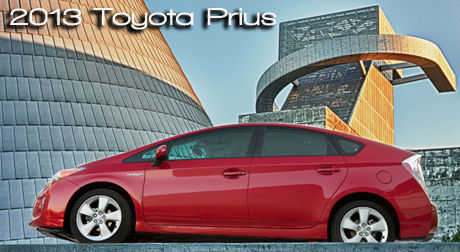 The 2013 Prius is hard to miss. Its distinctive profile can't be confused with any other auto on the planet with its smooth, low slung snout and chiseled hatchback hind quarters, looks that extend into the interior and into its very psyche. It's has a distinctive character that has carried through from early days more than a decade ago when the Prius became the benchmark for a practical, usable gasoline-electric powered vehicle that was more than a costly curiosity. Now in its third generation, it has sprouted into a subspecies quartet with larger wagon, subcompact wagon, original sedan replacement and most recently a fast charging plug-in hybrid version for extended electric driving mode with blended fuel economy as high as 95 MPG equivalent fleshing out the family tree. Although Prius now has gained its own family distinction, its emergence as a member of the Toyota dynasty is undoubtedly a reason for its increasing success, with millions now sold worldwide. Go to almost any continent or island nation and you'll probably find one of its siblings. When the Japanese auto maker takes on a mission, it tends to put in whatever is required including time, to accomplish that goal. So why choose a 2013 Prius, you ask. Beyond its unique appearance, it could be that it does so much. Everything inside the Prius seems designed to augment or highlight its primary mission; that of moving people from point A to point B while making as little environmental impact as possible. It could be called the ultimate vehicle for what the environmentally conscious refer to as ”hypermiling” -- careful driving practices meant to use every bit of energy to its max and waste none. The interior is well designed for usefulness in a smaller space, such as storage well below the center stack that can house an iPad or handbag. The stack is actually a prominent beam that houses controls and extends the fore-aft distance between front seats. For those prone to claustrophobia, it could take a little getting used to since each front seat is in a bit of a cubby outlined by the beam. (Knock something off the passenger seat onto the floor and it requires a trip outside to the passenger door to retrieve it, however, since it takes a twisted torso and long reach to maneuver over the center railing if one isn't tall.) Rear seating in this hybrid for five is sufficient. And room for luggage or shopping finds should fit nicely into the glassed-in trunk area under the hatch that also helps expand rear visibility. That's where the boldly configured rear design of the Prius makes sense. Although Prius now has its own family identity, its emergence has been as a member of the Toyota dynasty that traditionally puts in the necessary development, including time, to get it right long term. While testing the Prius, we cruised at highway speeds, reaching maximum speed limits with ease, but not close to the 112 MPH limit. We noticed a somewhat weighty feeling from the batteries at the core of its system, but appreciated that solid sense of security during a late winter snow squall when we were buffeted by strong winds. Its five star overall safety rating backed up our driving confidence. For those wanting comforts and conveniences while going green, Toyota supplies five trim levels that take into account their drain on the vehicle's energy systems. A top trim level, solar powered ventilation system (in a $1,500 option package) for example eases the air conditioning burden on hot days. Expected standard amenities are available, such as well-tuned audio/entertainment, Bluetooth connectivity, height-adjustable driver's seat, automatic climate control and heated power mirrors. Going upmarket through four additional trim levels adds such high end features as sunroof, navigation system, rearview camera, automatic headlamps, top JBL audio, head-up display or sporty trim enhancements. Toyota lists base 2013 Prius pricing (excluding fleet versions) at $24,200. Our up level “Three” test model totaled $28,138. The plug-in pricing starts at $32,000. Savings at the gas pump will balance out the cost of the Prius in varying degrees, depending on the continuing fluctuation in the cost of fuel. But for those who dread the prospect of gasoline surpassing the $5 a gallon level, the 2013 Prius could be the best insurance policy around. For more information on Toyota vehicles, click here.